House of Dreams is pleased to be tabling at Portland's VegFest again this year! Come out on Saturday and Sunday to stop by our table to say hello, and buy HOD gear, cat toys, and t-shirts. We would love to see you there supporting the kitties! VegFest is Oregon's premiere plant-based food and lifestyle event. There will be lots of tables and booths with free food samples, beauty samples, t-shirts, books, and vegetarian and vegan gear, along with talks on plant-based living. It's always a lot of fun and we hope to see you there! Come by our booth to say hello and see our photo book of adorable adoptable kitties. We'll have HOD merchandise including: tees, patches, buttons, magnets, fresh catnip pillows, bumper stickers and more! 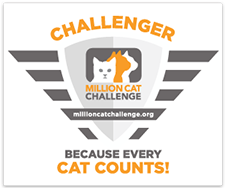 Come represent the only all-cat shelter in this fun event! We will be walking at Willamette Park in beautiful SW Portland to bring attention to House of Dreams and raise money for our shelter. There will be food and drink to purchase, as well as tables, games, and entertainment after the walk. Bring your family, friends and your mutt, if you have one. Dogs are optional. Join over 300 network partner organizations in walks around the nation this fall. All funds our team raises go to HOD! To visit House of Dreams' team page, http://support.bestfriends.org/site/TR/2018SYM/General?team_id=7714&pg=team&fr_id=1409. House of Dreams' annual Spring Plant Sale and Vegan Bake Sale is coming up on April 14th, 2018! We will be selling outdoor and indoor plants, decorative pots, and garden art, as well as raffle tickets and HOD merchandise. We are also hosting our Annual Vegan Bake Sale, held as part of the Worldwide Vegan Bake Sale events (see http://www.veganbakesale.org/ for more information). There will be loads of vegan treats and hot drinks for sale. We hope to see you there! All proceeds directly benefit all the kitties at House of Dreams. All proceeds from entire event directly benefit the kitties at House of Dreams. We happily accept cards, but we make more money for the kitties with cash (no transaction fee), so please consider brining cash! To donate plants/pots/decorative art, please email hodplantsale [at] gmail.com with subject line "Plant Sale" or call 503-262-0763. To donate vegan baked goods, please email Ellie at etwaymer [at] gmail.com with subject line "Bake Sale". House of Dreams is hosting Movie Nite on April 3rd, 2018! Come join fellow volunteers and supporters for a family-friendly evening at the movies with refreshments, beverages, movie bingo and a raffle. Entry will be by donation. Doors open at 6:30 pm and the movie starts at 7:15 pm. Entrance involves 2 drink tokens, pizza, and snacks. Extra drink tokens are $4 each. Many thanks to Lagunitas Community Room for providing the space and beverages, Sizzle Pie for providing the pizza, and After Dark Cookies for the snacks. We hope to see you there, and as always, all proceeds go toward the kitties at House of Dreams!